This must be an illusion. Are PC makers actually trying to out-cool Apple? 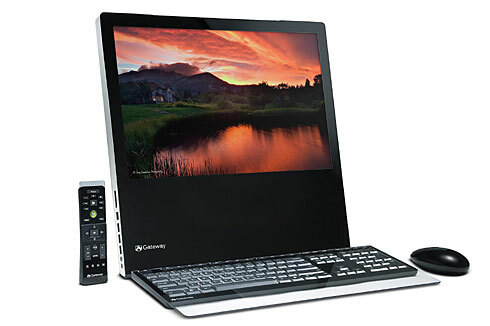 Gateway might be running in third place in the PC market, but the company's latest model suggests that it's taking the lead in design. The new One, a desktop with a wireless mouse, keyboard and all-in-one flat-panel LCD monitor, ditches the under-the-desk annoyance of the traditional tower with tangles of wires and cables snaking out the back. Like the iMac, the hard-drive and DVD slots have melded with the screen. Only a single power cord extends out the back. Sure, we're not quite at the everything-wireless stage that some MIT scientists see in our future, but this is an encouraging trend. Please don't tell me you actually that computer is actually a "leading design". First off, I really think it's ugly. Really ugly. Second, if you look at the 20th anniversary Mac, uhm, they're almost identical. Oh wait, the Mac was silver. My bad! But come on, that design was 10 years ago. Let's not give Gateway credit where it's not due. And again, ugly. And yes, I do think that about the 20th anniversary Mac as well. The design is sweet, but the concept isn't new. In the mid-90s you had the NEC Z1 (pronounced "Zone") and the IBM Netvista X41. The NEC had every conceivable port available (at the time) and even had a couple of PC Card slots, which Gateway should have included to round out the One. The Netvista X41 was similar (although some of the components were in the stand's base which acted as a counterweight to prevent tipping over). I have both sitting retired in my closet. I am all for the space-saving concept of these machines, and will probably look at the Gateway when it becomes available. Fine, Aaron, keep your rat's nest. I subscribe to the IBM Smart SOA Newsletter, a monthly e-newsletter sent out by IBM. The newsletter always provides interesting articles on current information in Service Oriented Architecture (SOA) and related trends in Business Process Management (BPM). Well this is a good approach but it is not new so we can not give credit to gateway, as it is owned by many other companies too. I am using the same of Toshiba.